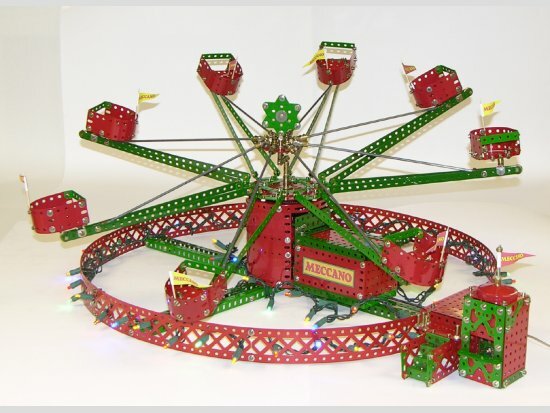 Like many others, I have come back to Meccano in my ‘retirement’ years. In my case 'The Gap' has been more than 50 years! As a teenager in Birkenhead (just across the Mersey from Binns Road) I got my first set, an Outfit 7, for Christmas 1950. Over time, I built it up with Accessory Outfits and individual spare parts to a Number 9+. But, of course, Accessory Outfit 9A was way beyond my reach in those days, so I had no hope of ever owning a Set 10. Nevertheless, I got hours and hours of enjoyment from my sets. 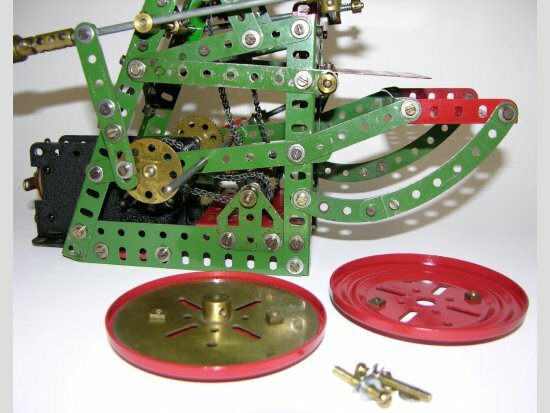 I always maintain that, if I know anything about mechanics, I learned it from my Meccano. Even as an adult I could not bear to part with it, so when I moved to the USA, nearly 20 years ago, my Set 9+ came with me. In the last couple of years I have been able, little by little, to add enough spare parts to now be the proud possessor of a Medium Red/Green Outfit 10+. My Set 10 only lacks the 6” pulley (who needs it? ), the extra Propeller Blade (a Spitfire is not on my list of forthcoming models! ), and the Plastic Flexible Plates, which were not incorporated into Set 10 until the 1960s. As I have started Meccano building again, I have been struck by just how unclear and incomplete the MM ‘instructions’ for those models really were. And to add to the problem, the halftone illustrations in the postwar MMs were so coarse as to be almost impossible to decipher. Probably the same comment can be made about the Outfit Instruction Manuals of the time. I can’t actually remember how I coped with all this as a teenager, but these days it drives me to distraction! My frustration with this will be noted in the following commentary on three of my recent models. motor, originally E6, and would make a very nice Exhibition model. It is fascinating in motion – it has five different things going in all different directions. The Parts Required list is wrong in many items, even accounting for the fact that some parts may have had a different number in 1938. Quite a few parts are not even listed. The instructions themselves are woefully inadequate. For example, the form of the framework of the Press is crucial for the journalling of the rods, the positioning of the gears, and the movement of the platen and rollers. But the illustrations are by no means clear, and the ‘instructions’ for the frame in the text are useless. they looked more authentic. ( I have actually operated Platen Presses from time to time.) I rather like my solution for the flywheel. A heavy brass 3½” Gear Wheel is sandwiched between two Flanged Discs. The MM model has the flywheel on the same axle rod as the eccentrics and it turned rather slowly. 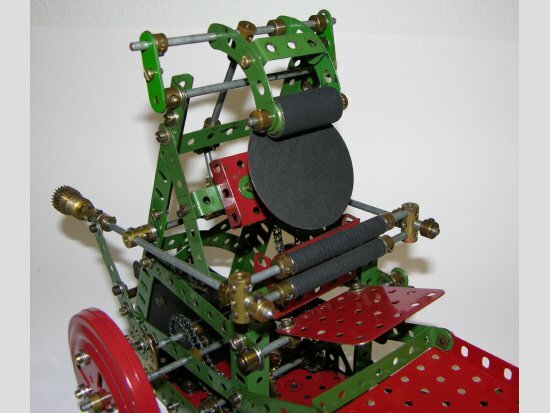 I moved it onto its own axle and geared it faster so that it could provide more momentum for the machine. But, in the event, this was all theoretical because, in the model, there is a worm gear in the train which actually prevents the ‘running-on’ that a flywheel is supposed to provide! For the inking rollers, which are totally unconvincing in the original, I first tried the solid brass rollers made for plate-bending machines. While they looked very smart, they were way too heavy for the drive mechanism, and would only run if I incorporated an extremely heavy counterweight at the end of the rocking arm. I solved the problem by making inking rollers from tightly-wound black paper, and also covered the ink feed rollers and the rotating inking plate with paper to match. The various movements of the mechanism need a great deal of fine tuning to get them all in synch. Altering one ‘throw’ alters all the other movements. 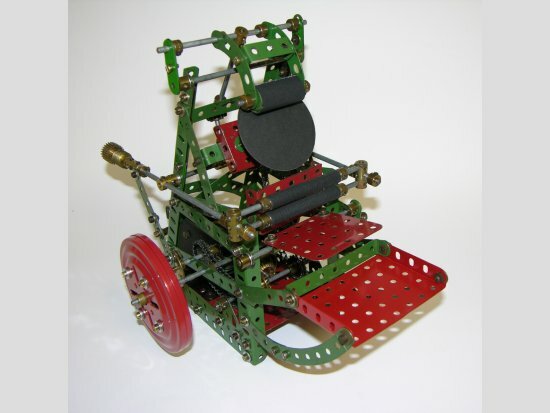 So, much tinkering is required – but that’s what it’s all about, isn’t it? If the Platen Press was built larger, it might be possible to actually get it to print from a linocut block or plastic letterpress plate. In addition to an inking system, it would need a synchronized clutch to allow the platen to pause at the feed table, and some method of varying the speed to allow for a gradual increase in printing speed. have the patience needed for it. We first made a puppet-style ‘robot’ man together, and he named him ‘Bob’. 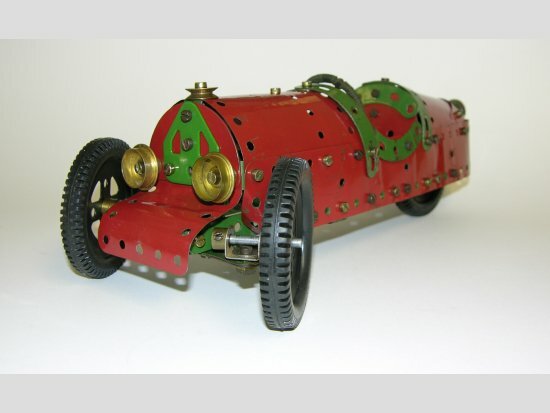 Then he saw a picture of a Morgan Three-wheeler and he wanted to build that. We used, as a basis, the Set 4 instructions for the Three-wheel Sports Car from the MM for April 1953. Of course, I needed to ‘improve’ it, so I was constantly building it as per the instructions, and then dismantling and trying something different. think my front wheel arrangement is a lot better than the MM model (of course I went a little beyond the Set 4 restriction), and my steering, though crude, worked very well. I constructed the body as a completely separate unit from the chassis, which seemed a more satisfactory building method. I used a lot of old parts for the car, so I didn’t mind severely distorting some of the plates. The Flexible Gusset Plate formed a neat solution for the tapered tail space. I must have bound the Steering Wheel with Cord some 50-years ago, but it was perfect for this model. I omitted the Magic Motor drive, simply because mine had done the vanishing trick years ago! But I guessed that such a wimpy motor would have a hard time pushing my beefed-up model anyway. I could have added a decorative motorbike engine detail at the front, like a real Morgan, and possibly other features like an exhaust pipe and windscreen, but my young friend was happy with it as it was. He played with it for hours, pushing it around and making full use of the dramatic steering. it in a magic show for my parents at Christmastime. 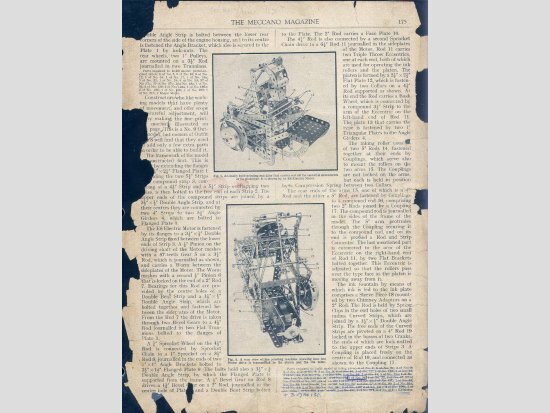 In that same issue, there was an article featuring ‘An Australian Reader’s Fine Model’. 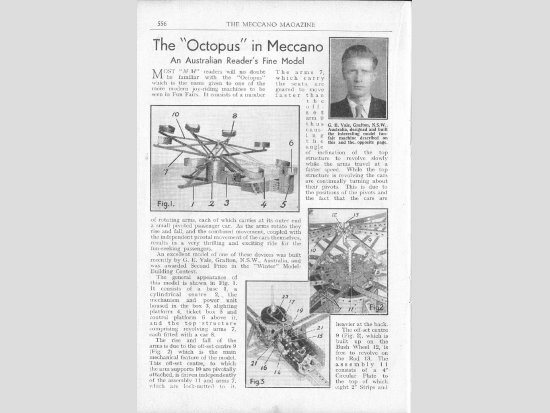 It showed a splendid Fairground Octopus built by a certain Mr G E Vale from Grafton, NSW. Now, in 2009, having amassed enough parts to make a Set 10+, perhaps this was a model that I could consider building? However, even just reading through the article, I could sense there were problems ahead! 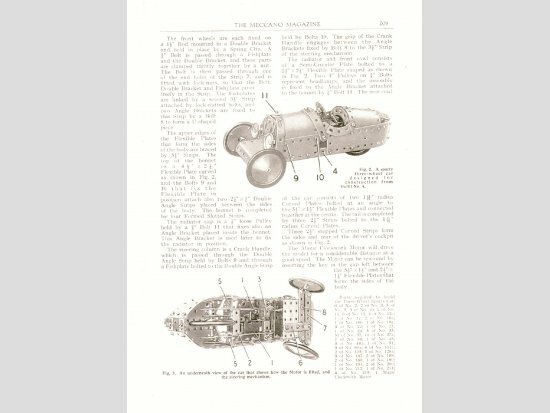 The MM did not provide full instructions for building the Octopus, it merely described certain features of it, and left the rest to one’s fertile imagination. And the illustrations for the model were equally unhelpful. The halftones are so coarse that, despite enlarging, reducing, and descreening them, then squinting at them from all angles, I am still unable to tell whether the buckets were 2½” wide or 3½” wide! Minimal text and illegible illustrations – not a good omen! But the general appearance of the Octopus is discernable from the MM illustrations, and a sense of the scale can be gained (in places) by identifying certain parts – I do recognize a Hub Disc when I see one, even in the fog. And the basic structure seems clear – but, just how long are those Angle Girders that form the cross frame? Mercifully, the gear train illustration is fairly clear. The model requires that the separate drives to the Arms and the off-centre Rotor should be on the same shaft. The method of driving the Arms by means of loose sprocket on the centre shaft seems to be a good solution. But the drive to the Rotor needs to be disengaged to allow passengers to disembark at the platform, and a brake needs to be applied to stop the Rotor turning due to friction. The gearing suggested in the MM looks fine, but the method of controlling the ‘disengagement’ and braking is difficult to understand and, what I am able to understand, seems to be somewhat ‘dodgy’. The description also mentions installing a ‘cushioned’ take-up drive to the Arms to avoid a jerky start. That sounds sensible, but for the life of me I cannot make out from the text how Mr Gale did it. Take a look at the article and see if you can make sense of it. Anyway, after much sweat blood and tears, and liberal use of imagination, my Octopus, is completed, and all the essential movements work. For the ‘cushioned’ take-up drive I linked a Tension Spring between two Collars, one bolted to the loose 1½” Gear Wheel, and one to a fixed Bush Wheel above it. This does give a nice cushioned start to the rotating Arms, but I found that part 43 was too sloppy (especially after some use), so I replaced it with a shorter and stronger tension spring, obtained from a local hardware store. For a more positive disengaging control I used a Crank fitted with a long bolt, which works between two Collars fastened to the bottom end of the ‘layshaft’. For the brake, I used a Pawl (with boss) engaging the teeth of a small Bevel Gear. A more positive brake could possibly have been made by using a Pawl with a Multi-purpose Gear, but the space under the centre of the cross frame is really, really tight. I didn’t understand, or like, the use of Socket Couplings above the ball bearing race, so for the drive to the Arms I locked together the top 3” Pulley, the 1½” Sprocket, and the Circular Plate (I substituted a 6” one for the 4” original.) 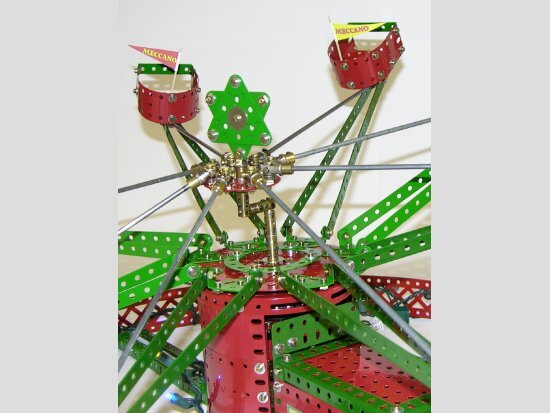 This whole unit sits on the ball bearings, but rides loosely on the centre shaft. 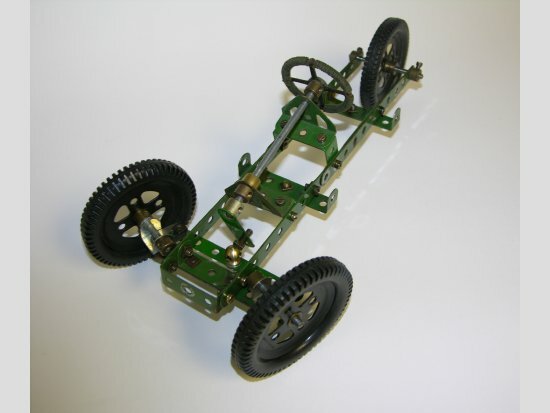 I used eight 11½” Axle Rods (specially purchased for this model), as the supports for the Arms. I think they look much more authentic (and decorative) than the Perforated Strips in the original, and so worth the expense. I didn’t follow the extensive ‘outbuildings’ visible (sort of) in Mr Gale’s model; nor his complicated control box. I just constructed an Alighting Platform, simple controls, and Ticket Kiosk. It was fun decorating the Kiosk and making a centre Star. The Meccano pennants, cleverly crafted by Alan Esplen, add to the visual treat as the buckets swivel around. Some old, resprayed Braced Girders do great service as a circular boundary fence. One surprise for me, in constructing this model, was how heavy everything is. The weight puts an enormous strain on the motor, the drive train, and on the supports, especially on the off-centre Rotor. The weight of the buckets, sitting at the ends of long Arms, is especially significant. There is a distinct tendency for the centre Rotor shaft to bind, and to rotate at the same speed as the Arms. I suppose a lighter bucket could be made from plastic plates (if I had any). My wife’s suggestion was to use Styrofoam cups! If I were to build this model again(! ), I would certainly strengthen the gearbox frame a great deal, and maybe substitute a Thrust Bearing for the bearing made from 3’’Pulleys, to lessen the tendency of the centre shaft to bind in the bosses. I was over-optimistic about having plenty of parts for this model with my Set 10!! When building an Octopus you always seem to need at least eight of everything, and I ran out of Semi Circular Plates and small Flanged Plates used for the buckets. At one point, I thought I might have to make do with a Quadrapus!